Thursday. Late. Hollywood Boulevard is nearly deserted. Up the block on Vine Street a record-shaped, neon-lit building called Capitol Towers stands silhouetted against a dark sky. 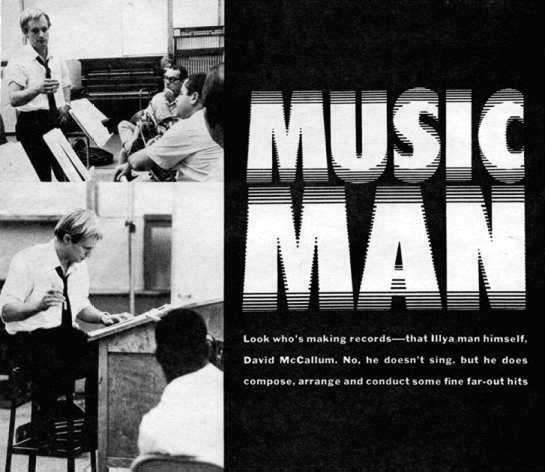 As you approach the building, a policeman directs you: "The David McCallum recording session...that's in Studio B." Outside the studio a red light is blinking. You cannot enter, but you look in through a small sliver of glass on top of the heavily padded soundproof door. The control room is small. Less than half a dozen people are assembled. David McCallum is leaning over a large sheet of music, making notations, studying the score. Even through the closed door you feel his tension. Although he is a non-smoker, he smokes. His jacket is off; his shirt collar is open; his tie hangs loose. Soon the red light goes off and the door opens. David looks up. For one tiny second you think you can detect a slight smile, but it never appears. You do not expect it. You remember the things he'd said the day before: "I'm nervous about all this. I know I'm going to feel insecure when I get in front of those musicians. You know how liquid gets all churned when you put it in a blender? That's how I feel." Making records is a new experience for David, yet it is really the culmination of training which began when he was a boy. He was born the son of musicians, and has studied piano, violin and oboe. He liked the oboe. He was good enough to be accepted at London's Royal Academy of Music. All his life, professional musicians have marveled at David's natural talent, but until now he has never performed publicly. He turned down many offers to record what would be a sure-fire hit song. Finally, he said, "I'll do a record, but I won't sing." 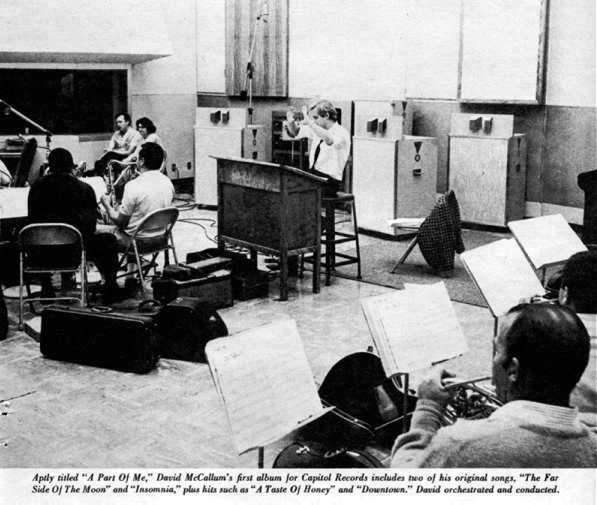 He wanted to orchestrate and conduct; he wanted to make a record which he could feel down deep inside, from that place within where music is created. The deal is set. David selects the instruments to be included. He litters his home with blank sheets of scoring paper on which he writes out each song. Improvising sounds he hears in his head and translating them onto paper. The musicians are hired. The session is scheduled.... The big night has arrived. It is David's big moment. The room is filled with thrilling sounds, sounds like nothing ever heard before. You don't want it to end, but it does, much too soon. It's over. It's a great success. The musicians are enthusiastic. David thanks them. He jumps and whirls and dances around the studio. He did his best and it was good, very good.